Thankfully, there are many options to consider for care. A cosmetic dentist can restore the brightness, whiteness, and overall beauty to your smile using the latest in advanced treatment options. Right now, we would like to focus on ZOOM!® teeth whitening, a professional dental bleaching system that is extremely safe and effective. ZOOM!® teeth whitening is one of the most popular professional dental bleaching options out there today. It involves the use of bleaching gel and a laser light in order to achieve optimal whitening results. There is basically no comparison in terms of whitening quality. 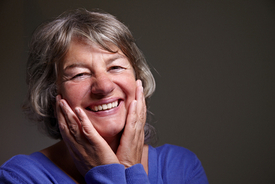 ZOOM!® teeth whitening blows away all of the store-bought treatment options. In just one ZOOM!® teeth whitening session, a patient's teeth can be brightened by up to eight shades. It would takes weeks for even the most sophisticated tray whitening system to achieve these kinds of results. In addition to speed of treatment, there is also safety to consider. Because ZOOM!® teeth whitening is professionally administered and performed, issues with tooth sensitivity and gum sensitivity are less serious, and serious complications are unlikely. Professional teeth whitening is a great option for surface stains and discoloration. Ideal candidates for ZOOM!® teeth whitening are people with these kinds of extrinsic tooth stains, which are often the result of food, beverages, and tobacco products. Patients should be in otherwise good health and not suffer from tooth damage or tooth decay. It's also important that patients have realistic expectations about the nature of ZOOM!® teeth whitening and what it can achieve. The first step of the ZOOM!® teeth whitening procedure is cleaning the teeth. The dental bleaching gel is then applied to the tooth surface or the spots on the teeth. A laser light is then used directly on the teeth to unlock the deep bleaching properties of the gel. Patients will wear protective eye wear during this time. The entire process is repeated up to two more times in order maximize the results. The whole process takes roughly an hour. Tooth sensitivity is a common side effect of all teeth whitening treatments. Thankfully it only lasts two or three days tops, and we take steps to mitigate the sensitivity during the first day. Patients are advised to avoid foods and beverages that are hot or cold until the tooth sensitivity subsides. Sometimes patients have stains that are especially tough. In these cases, multiple ZOOM!® teeth whitening treatments can be scheduled in order to totally brighten the patient's smile. These matters can be discussed in greater detail during your consultation at the practice. If you would like to learn more about ZOOM!® teeth whitening and if it is the right solution for you and your needs, be sure to contact our Wilmington cosmetic and restorative dentistry practice today. The entire team at Smile Solutions by Emmi Dental Associates is eager to meet you in person and help you get the clean, beautiful, healthy smile that you have always wanted to have.